Want to be the most popular person on Facebook? All you have to do is write longer status updates, talk about music and sports, don't be overly emotional, don't talk about your family, don't refer to time and use the word "you" a lot. That's according to a recent Facebook study that took a look at the way people write and react to status updates. Once the updates were anonymized, the words were organized into 68 different word categories based on the Linguistic Inquiry and Word Count (LIWC) -- a text analysis software program created by James W. Pennebaker, Roger J. Booth, and Martha E. Francis. Some examples of word categories used in the study include past tense verbs, prepositions, religion and positive feelings. Here's a look at some of the study's findings. Facebook youth are an angry, foul-mouthed, selfish bunch, according to the Facebook study. The company found that young people express more negative emotions than their elders, swear more and use personal pronouns such as "I" and "Me" more often. Turns out, most folks on Facebook are morning people. 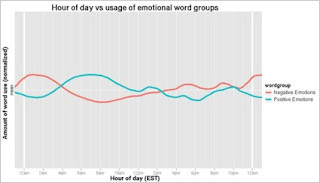 The study found that status updates expressing positive emotions were highest in the morning, and became increasingly negative as the day wore on. So basically, we Facebook users--at least the U.S. English speakers, anyway--start the day in a good mood, but as the day goes on and the coffee wears off we become increasingly demoralized. How cliched can you get? Facebook's study also confirms something that bloggers and Fox News have known for years: negative comments produce more online activity. Sure, Facebook users might click the like button more often on updates expressing positive emotion. But Facebook found you can't beat negativity for user engagement, as dismal status updates garnered more comments than positive ones. People are also less likely to comment on religious status updates, and rarely comment or like status updates referring to sleep. Confirming that it's best to avoid religious topics when in polite company, and that no one else you know is ever awake when you are dealing with a bout of insomnia. You can find out more about Facebook's status update study here, including the revelation that you and your friend's tend to talk about the same stuff. Confirming that, while addictive, Facebook can sometimes get a little boring. What Is Twitter & What Does It Do For Businesses?